Try our new Knorr® Selects™ sides made without any artificial flavors or preservatives. 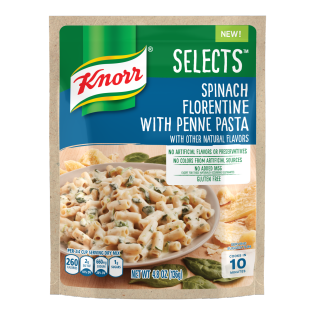 Prepare your taste buds for our Knorr Selects Spinach Florentine with Penne Pasta (4.8oz). We've combined creamy asiago, cheddar, parmesan, and romano cheeses with spinach and brown rice pasta to create a gluten free side your family will fight over bite. Spinach Florentine with Penne Pasta is rated 4.2 out of 5 by 40. Rated 5 out of 5 by Kim12 from Delicious I didn’t expect it to be so good and addictive. After trying the first spoon I kept thinking about the next one. The entire portion was very tasty and it matches with any kind of meat. It’s consistency was of a creamy cheese with spices. Noodles were cooked perfectly neither to hard nor too soft. I can suggest to be served with meatloaf, meatballs, chicken breast and any kind of vegetables. I eat mine with ground beef and veggies and it tasted delicious. I can’t wait to try other varieties. The simplicity and quickness of preparation is surprising. Additionally, I am glad that this product has no artificial flavors or preservatives, colors and msg inside. It was great and delicious. Rated 5 out of 5 by golf widow from Yummy I used this to make a one bowl dinner by adding a can of pieces and stems mushrooms and two chicken breasts diced up and cooked separately. I thought it tasted great and cooked appropriately. It was easy and great! I did receive this product in the mail to try and I am glad I did. Rated 5 out of 5 by Pastamama from Easy to prepare! This was a very easy to prepare dish. I love pasta n so does hubby. Love the taste and knowing it is healthy is wonderful. Will be trying more Of Knorr very soon!